LeLounge! is an acoustic duo based in Manchester who have performed at hundreds of weddings as well as public gigs and parties throughout the North West UK. They are available for hire for any event in Cheshire, Derbyshire, Stockport, North Wales, Lancashire, Staffordshire or South Yorkshire. Perfect entertainment for Wedding Breakfasts, Anniversaries, Drinks Receptions, Restaurants and Bars requiring live acoustic music. 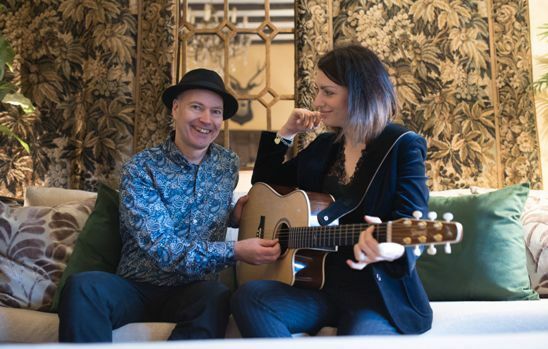 The duo comprises singer Laura-Jayne Hunter and guitarist/singer Dave Carter. Party & Wedding DJ Service and PA Add On If you want to dance to louder music later LeLounge can provide all the recorded music you'll need, a DJ service, disco, lighting and your own microphone for speeches and announcements. They'll build your ideal playlists in advance and bring thousands of hits to satisfy your guests’ requests on the day. Wedding First Dance or Special Requests Let LeLounge know if you would like them to perform a song that isn't in their current repertoire. This could be your first dance, or a special song for the occasion. Public Liability and Emergency Cover Public Liability Insurance of up to £10million and electrical equipment is PAT tested each year. For peace of mind LeLounge have deputy musicians (both guitar and vocal) to cover for emergencies. Planning, Clothing, Playing As experienced professional wedding and function musicians LeLounge will always dress smartly when performing. Performance times can be adjusted to fit in with auctions, buffets, raffle results or speeches and arrival and set up times can usually be arranged to minimise disruption to guests. Set up time is normally twenty minutes, and they require an area of around 2m x 2m. Classical Guitar, Dance Party Duo and Wedding Singer Options Dave and Laura-Jayne can offer three additional live music options to add further variety and sophistication to your event. Classical Guitar pieces can be performed by Dave during the welcome drinks or the ceremony itself. Laura Jayne Hunter can also sing solo or using backing tracks during any phase of your event, performing anything from easy listening to popular dance hits. They can also perform party dance classics from their function band LeFunk's repertoire, with live vocals and guitar performed over self produced backing tracks for bass, drums and keyboards. This means you can start softly with the acoustic duo and switch to the sound of a full band when your guests are in the mood for dancing!